Super Nintendos were the first visual devices I bent. I built the first versions in 2007 for my minor degree at the Hochschule für Gestaltung in Offenbach, Germany. Inspired by a DJ setup, these were the only things that I built two identical units of. Also, I've built two different versions with a third one still on the to-do pile. I spent a hell of a lot of time doing that, so please prepare to be bored brainless by my ramblings. I chose Super Nintendos because they're old but not too old. 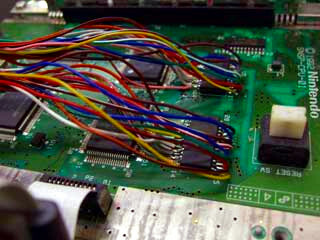 The Snes belongs to the last generation of consoles with hardware accessible for circuit bending, or at least that's what I thought when I worked with them, I've been proven wrong impressively. They have a nicely structured PCB and the crucial chips are common. They're only 16 bit machines, but there's quite a few games around that give you a good impression about how powerful their output can be. They use hardware cartridges which are a little harder to program than CDs but FAR more reliable. Presumably because being built with SMD chips, they were not too common in terms of bending when I started working with them and still aren't. I've seen quite a few bent NESes (sorry, I don't know a proper plural for NES) turn up on YouTube and the like and the ever exciting Gijs Gieskes mastered bending SEGA Systems to such an awesome extent, I would have felt like plagiarizing by starting off with these Systems. Getting started with bending wasn't too hard, because after a few years of doing this stuff I couldn'd help learning some basics. The most important thing was: Chips that store data look the same most of the time. With a SNES, there is no big difference to that. I found the right IC's almost immediately after I opening the first one. The video RAM chips are surface mount devices though, which means I had to be a little more considerate with consuming anything that might make my hands shaky. Also, they seemed to be quite sensitive with static electricity, which I found out the hard way by frying my first two units with a crappy soldering iron right away. I glued the keys together because my very first plan was to use this keyboard with my feet to have my hands free for making music. Of course, this turned out to be a very silly idea, because I'd have to sit during my performances, which is most of the time completely out of the question. Later on, I also installed a SNES controller in the Keyboard and some additional circuitry to automize stuff, but the overall look pretty much stayed the same. I built two of these units. 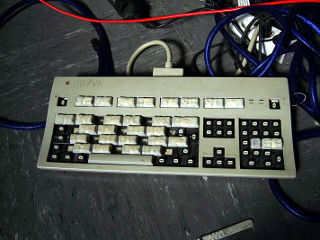 For the other one, I used a really cool old school 'Silicon Graphics' keyboard that was another leftover at my university. This was the setup I did my minor diploma with. 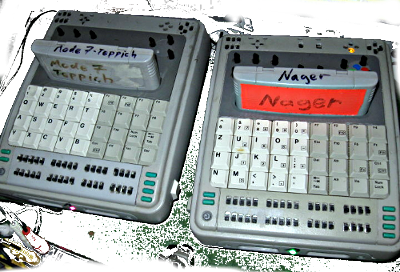 These keyboards where fun to look at and made sense conceptually, but had the major flaw of being huge and heavy. I had a transatlantic flight coming up and taking this setup was so not an option. I was already halfway trough building a new keyboard for the old setup, when I decided to just build a whole new version. I had a pile of Super Nintendos standing around anyway and by that time, I had spent about a year of researching and working with them. So I was so immersed in the whole thing, it only took me a few weeks from the initial idea to the finalisation of the mark 2 models. This time, I wanted the units to be completely self-contained and everything layed out in a stage-friendly way. I still liked the idea of computer keys as interface for the video ram glitches. I had some cherry mini keyboard pcb's with mechanical switches that I gutted for this. The keys had just the right size to be conveniently integrated into the SNES shell. The small switches under the keys mirror the bend matrix, so a glitch can be made more permanent. There is a tiny joystick to the left of these switches, which basically replaces a controllers D-Pad. Above the joystick, there are two buttons for 'Start' and 'Select'. 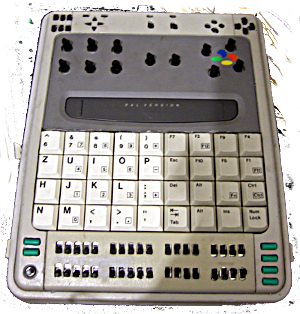 To the right, there are four buttons that are an equivalent to the ABXY buttons of a joypad. there are two more computer keys on the sides that act as shoulder buttons. 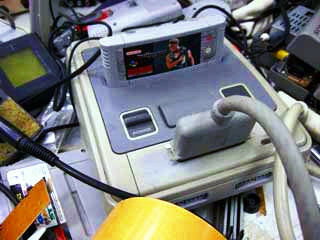 The section above the cartridge slot is a sort of randomised autopilot for the joypad. The pots connect the D-pad and ABXY buttons to simple squarewave LFOs built with a 40106 Hex Schmitt trigger. Each direction and control has a dedicated LFO. With this setup, it is for example possible to automatically create chaotic movements, while you have your hands free to mash around on the glitch keyboard. The last section is the topmost one. 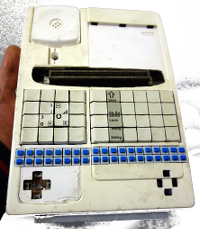 It consists of switches to basically 'push a joypad button' permanently and some indicator LED's that light up once one of these 'button pushes' occurs. Very useful, as the whole autopilot part can get quite confusing sometimes. Hm, You probably could have guessed it. This one's only halfway done so far. I already have two working systems and have moved on a bit from the pixelated aesthetics of 16 bit gaming systems. So it's not exactly top priority at the moment. Nevertheless, I am convinced I am going to finish it eventually. Until then, here's a picture of the progress so far. In contrast to the other versions before, there will only be one Snesphone. Enough is enough. I had to chop off quite a bit of the circuit board to make it fit into the smaller housing. The glitch matrices are already in place. They are made of the same switches as with version 2, only this time, I cut of some bits of the keycaps so they take up less space. The Dpad and Cpad will be next. I still haven't decided if I'm going to implement the same autopilot scheme as with the earlier SNES or if there will be some other solution for automation.